Husam speaks Arabic fluently and served as a youth leader at his local Islamic center. His volunteer experiences include serving the homeless at the Day of Dignity and helping a Syrian refugee acclimate to life in the United States. 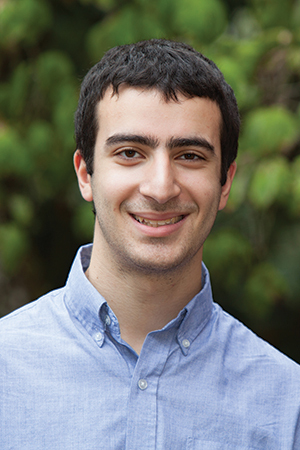 With hopes of building a career in medicine, Husam’s focus is on science. He was awarded the National Academy of Future Physicians and Medical Scientists Award of Excellence and was named his school’s Most Outstanding AP Chemistry student. What are some things you’ve been doing outside of the classroom since you’ve been at UO? I really like playing tennis. I played all through high school, and I’m taking a tennis class right now, which is really nice. I learned to juggle in middle school, and it's something I do for fun a little bit here and there, just so that I don't lose that skill. It's always a cool party trick. Why UO? I wanted to stay in-state. I didn't want to go too far from home. I was lucky enough to receive the Stamps scholarship. That pretty much made my decision for me. It was an amazing opportunity that I just couldn't pass up. Also, I love Eugene. Biggest academic accomplishment before coming to UO? Being voted as "Smartest" and "Best Student" by the senior class. What has been one of your favorite things about UO so far? Fall term. I really liked the atmosphere at the football games. I'd never been to one before. I'd always seen them on TV. I was a big fan of my physics class. I took physics in high school, but this is physics with calculus, so it's more in-depth. I really like the way that class is structured. It forces me to learn on my own. When you go out into the real world, you're going to do all the discovering and learning yourself, so you might as well develop that sort of mindset. That's something that college has provided me. What are your plans for your thesis? I want to join a research lab and stay in that lab over the course of my time here and develop relationships with the professors and stick through the overall research process. I want to really feel what it feels like to say we tried this and got these results and now we're going to try something different. That constant trailblazing, pioneering, and discovering appeals to me. What are you most proud of accomplishing since you started at the UO? I took a class last term about medical terminology. That class had a lot of terms that you had to memorize. We studied different body systems. The final test had a lot of terms on it. I ended up getting an A on it, because I made flash cards. I normally don't need to do that, but I knew I would need to for this class. I didn't want to try to learn 10 weeks’ worth of terms the last week of class. It's too much. I was really proud of myself that I was able to stay on top of it and check myself. That was a real stepping stone for me. I was able to break my old habits and start to develop new ones. I feel like I grew during that term. What’s one of your qualities that sets you apart? I've never been shy in class. I've had several professors thank me for speaking up in class. There are moments in class where a professor will ask a question and you'll hear people around you whispering the answer, but they don't share it with the class. I've always been put in a position to help out in class. I was bright growing up. I would finish my assignments early. I remember in my sixth grade math class, I finished early. My teacher said to me, “Now that you're done, you should help the people around you finish.” I was like, “What? They should do it themselves.” Then eventually I started helping the girl sitting behind me and the guy sitting to my left. I saw how appreciative they were when I was helping them. That was rewarding for me. Once I got here, I realized there is more to helping someone than just feeling that satisfaction. It's actually seeing them understanding what's going on. You've made their lives easier. I remember that sixth-grade class very vividly. We were doing stuff in math to solve for x. I was like you just get x by itself. Solve for x. They're like, “What do you mean?” Eventually, you really do learn that people think in different ways. Not everyone has the same mindset. You really have to be able to try and explain it one way, but then if you're running into a wall and you see that it isn't clicking, it forces you to think about it in a different way. That can help you develop a deeper understanding of the topic. If you've only known one way of solving a problem or understanding something, then you have to attack it from a completely different angle. That can really reinforce the idea and the concept in your mind. That can allow you to understand the concept at a deeper level. Describe a mentor or professor who has positively influenced your experience at UO. I've been a fan of writing, but more like scientific journal writing. So I really had to stretch myself in my memoir class. It was nice having a professor like Professor Mossberg. I really grew as a writer under her because of how much energy and passion she put into the class. At the end of the term she invited the whole class over to her house and cooked a lemon meringue pie. She wrote an entire memoir about the pie and read that to us. It was very homey. How do you connect with other students on campus? When I first got on campus and met with my pre-med advisor, she told me about a group called MAPS, the Minority Association for Pre-medical Students. They meet once a week and bring in different doctors and organize different volunteer events. That was really cool because I got to know a lot of people through that organization. Toward the end of this term they had spaces on their board, and I applied for the Tutoring and Mentoring Coordinator position. I had an interview and was awarded that spot on the board. Hopefully I can help them grow the group. They have been so welcoming to me, that I want other students to feel that same sense of community, welcome, and friendship. In the honors college you are surrounded by like-minded people. They are bright and driven because they're in the honors college. College is about discovering friends and making connections and enjoying those experiences. What are your plans after graduation? My goal is to apply to medical school. I've always liked chemistry. When I took it sophomore year of high school I absolutely loved the subject. I thought just learning about atoms and how everything interacts was really cool. My senior year I took AP biology and that was really cool as well. Learning about your cells and DNA and how everything about your body works. I just figured why not combine the two and go from there. I do want to keep my options open to switching to the human physiology major as well, that's something that is unique to UO. It's a very strong program. What advice do you have for incoming students? Really be on top of your reading. It's easy to put it off. That compounds on itself, and you can find yourself really far behind. The honors college classes are fun, but they are fast paced. They know we can handle that pace. There is a reason it's competitive to get in. You really have to be on top of your game.